What Is a Bubble Fly Rig? The bubble fly rig uses a clear plastic float to cast fishing flies without using a fly rod. It is also used to cast lightweight lures and baits that are difficult to cast using conventional fishing gear such as bait-casting and spinning rods and reels. The float is heavier than the fishing fly, lure, or bait, and provides the needed weight to cast them using conventional gear. If more weight is needed to cast effectively, water or vegetable oil can be added to the clear plastic float's hollow body. In addition, the float is made with a clear plastic material that minimizes spooking fish. Fish likely see the float as a bubble in the water, and which is why this fishing technique is referred to as a bubble fly rig! This article describes the three bubble fly rigs detailed in the sections below. For easy reference, we call them by the name of the manufacturer of the float used in the rig. 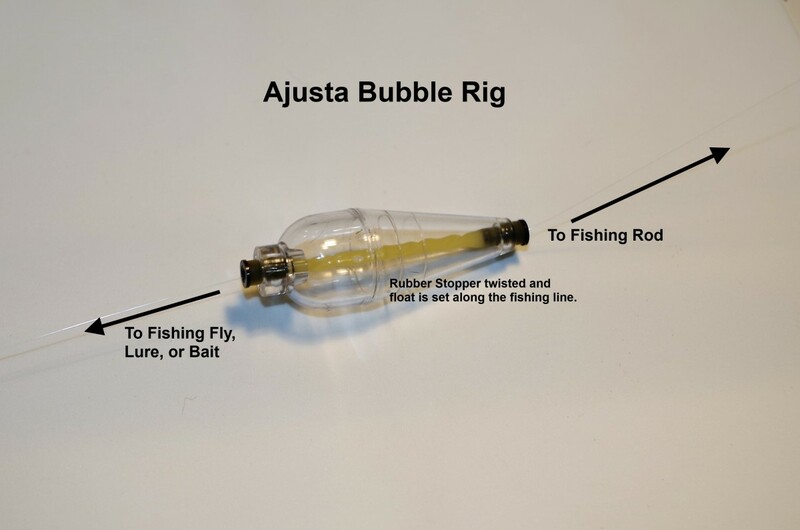 Each rig is used for different situations; however, the Ajusta Bubble Rig seems to be used most often by the Team as it is the easiest to set up and use when conditions change. Do read on to learn more about bubble fly rigs! The first of the three bubble fly rigs described in this article uses the Tough Bubble float, two beads, and mono-filament line. This is a quick rig to tie and allows for adjusting the float by loosening the loops through the beads. It is sensitive to light strikes but limited in strength because of the loops created when attaching the beads. It should only be used for smaller fish like stocked rainbow trout in the 9-13 inch range. Also, it has a stopper that can be opened to add water or vegetable oil to increase the weight and improve its casting ability! 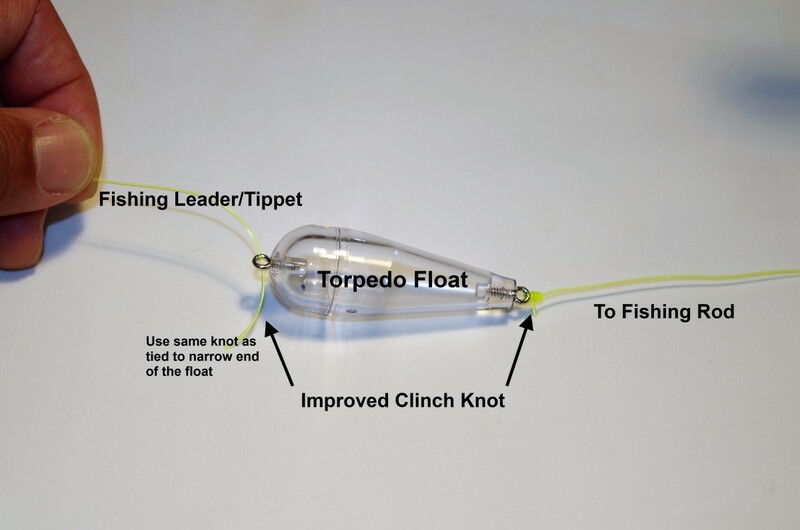 If larger fish are likely, it is better to use the Torpedo Float Rig. 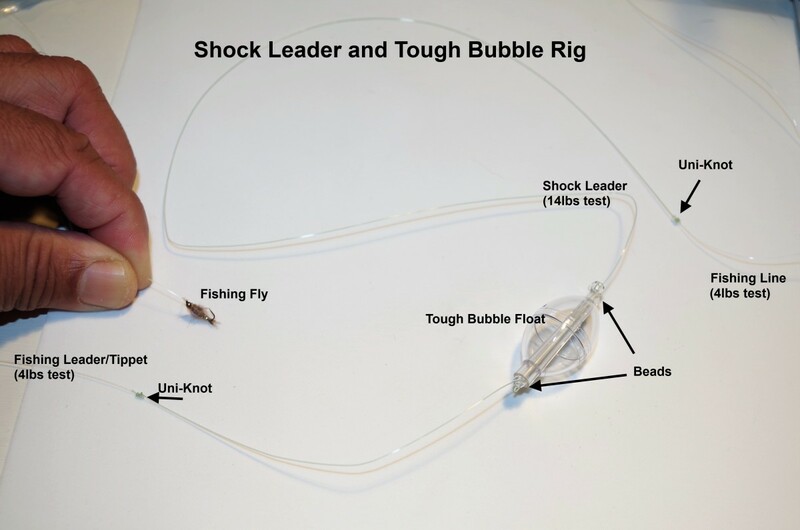 However, the Tough Bubble Rig will handle larger fish when a "shock leader" is used. 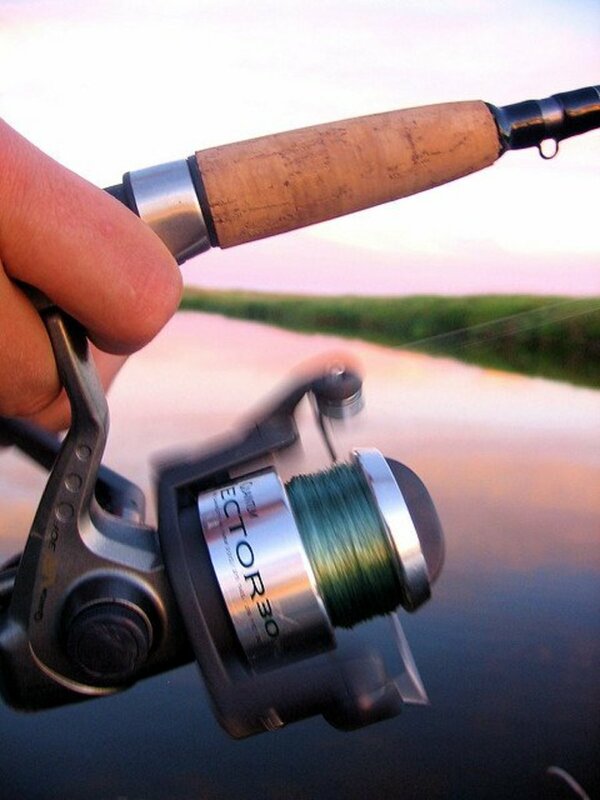 Begin by threading a bead with the fishing line from your rod, stopping about three feet from the end of your line. Then, double the fishing line back and through the bead a second time, passing through the same end as before. This should result in a loop being formed around the bead. Next, thread the fishing line through the Tough Bubble's tapered stopper, noting the narrower end should point toward your fishing rod. Taking the second bead, repeat steps 1 and 2. When done, a bead above and below the Tough Bubble should result (see Picture 1 below for reference). 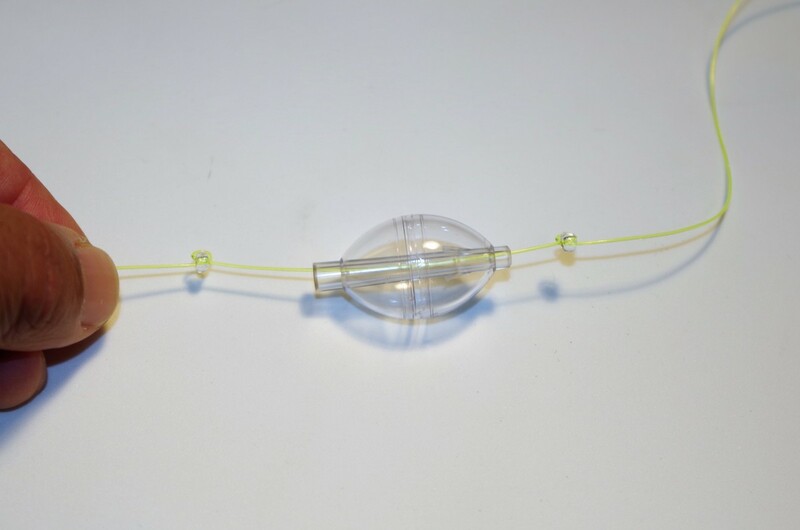 Next, if more/less fishing line below the Tough Bubble Rig is desired, loosen the loops around the beads, and move the Tough Bubble until the length desired is obtained. Finally, tighten the fishing line to secure the loops around the beads. When the fishing line is tightened, the bead should look like the Picture 2 below. Optional: If large fish are in the area, use a shock leader as shown in Picture 3 below. The shock leader uses a stronger line than your fishing line, and follows the same steps as above, except the shock leader is tied first to your fishing line using uni-knots (see Double Uni-Knot video at the end of this section). At this point, the Tough Bubble Rig is ready to fish; just add your favorite fishing fly or lure! Picture 1: Tough Bubble with line looped around beads. Picture 2: Tough Bubble with line tightened and ready to fish. Picture 3: Shock Leader and Tough Bubble Rig. The second bubble fly rig described in this article uses the Torpedo Float and four-pound mono-filament line as a leader/tippet. This is a quick rig to tie but does not readily allow adjusting the float and leader length. If adjustments are desired, the leader/tippet is cut and retied which may be tough under cold conditions when fingers become thumbs and knots are harder to tie. The Torpedo Float Rig is sensitive to light strikes and is stronger than the Tough Bubble Rig since the fishing line is tied directly to the float instead of looped through beads as in the Tough Bubble Rig. Because the Torpedo Float Rig does not have a stopper, you cannot add water or vegetable oil to its hollow cavity to increase the weight. With the fishing line from your rod, attach the end of your line to the Torpedo Float's narrower end using your favorite fishing knot. The Field Team normally uses an Improved Clinch Knot. Next, determine how much line you want to fish below the Torpedo Float which may vary as conditions change throughout the day. The Field Team likes to start with three feet and making adjustments from there. Then, attach the 4lbs mono-filament to the wide end of the Torpedo Float using the same knot you used in Step 1 and cut the line to the length determined in Step 2 (see Picture 4 below for reference). Finally, add your fishing fly or lure, and you are ready to go fishing! The third and final bubble fly rig described in this article uses the Ajusta Bubble float. It is the easiest and fastest to set up compared to the other two bubble fly rigs. 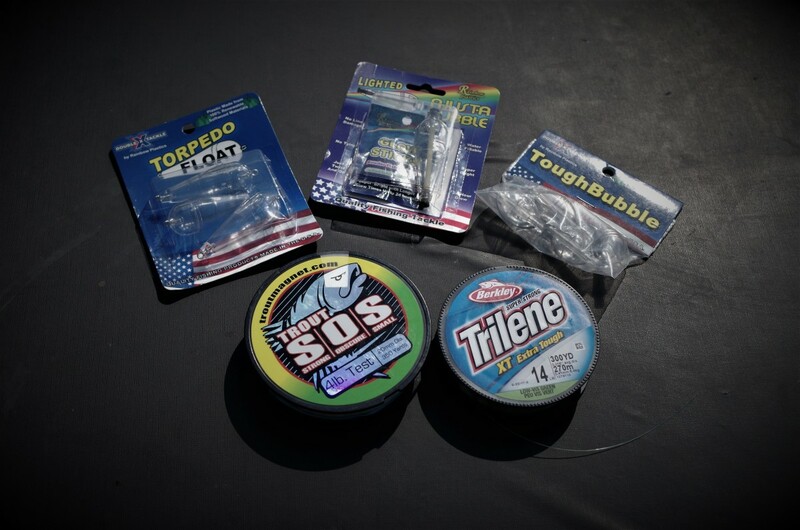 Moreover, it is readily adjusted to increase or decrease the leader/tippet length by untwisting the rubber stopper, moving the float up/down the fishing line, and the twisting it again. If using ultralight fishing gear and large fish may be encountered, then use the 14-lb mono-filament as a shock leader and the 4 lbs mono-filament as a leader/tippet. The Adjusta Bubble Rig, like the Tough Bubble and Torpedo Float Rigs, is sensitive to light strikes and is the rig the COAF Field Team tends to use most often because of its ease of setup and adjustment once in use. The one detractor to the Ajusta Bubble Rig is it costs the most of the three Bubble Fly Rigs described in this article. Regardless, do keep this one handy... it can mean the difference on some fishing trips, especially when your fingers are frozen while trying to fish a river this winter! With the fishing line from your rod, thread the end of your line through the Adjusta Bubble's narrower end. If a shock leader is desired, then attach the shock leader to your fishing line using a Double Uni-Knot, and then attach the leader/tippet to the shock leader using the same knot. Else, skip to Step 3. Determine the length of line you want to fish below the Ajusta Bubble. Then, position the Adjusta Bubble along the fishing line (or shock leader) to the desired length determined in Step 3. Next, pull the rubber stopper and begin twisting it to secure the Ajusta Bubble to the fishing line. When done, the Adjusta Bubble should not move. Add your fishing fly or lure, and you are ready to go fishing (see Picture 5 below for reference). Whipping is in essence using what some may know as a modified Carolina rig, here called a whipping rig, to cast out from shore and retrieve a lure, typically a soft bodied grub of some kind. While in other places people use this rig to fish the bottom, this rig is almost always used here for medium to top water fishing, as in most places in Hawaii a slow retrieval of this rig will cause snags on the reef, which will likely be impossible to retrieve without diving. Update: The COAF Field Team finished the video showing how we fish the Bubble Fly Rigs mentioned in this article. Do check it out as well as the "Another Quick Update - Bubble Fly Rig" video below. How We Fish Bubble Fly Rigs! 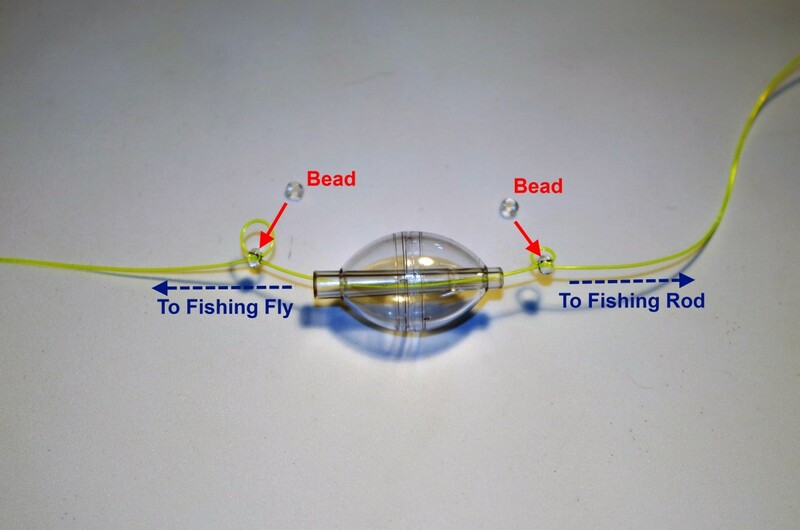 As mentioned at the beginning of this article, the bubble fly rig uses a clear plastic float to cast fishing flies without using a fly rod. 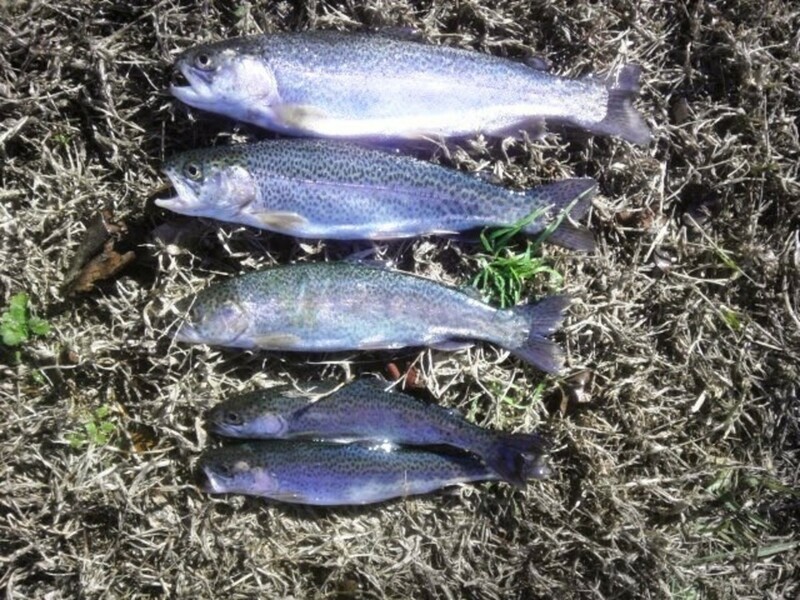 It also allows casting lightweight lures and baits using heavier fishing gear. Moreover, the variant used by fishermen in Hawaii called "Whipping" expands the bubble fly rig concept to saltwater game. It's a versatile tool to have in your tackle box. Bubble fly rigs are for fisherman who want to fish with fishing flies but do not have a fly fishing rod and reel, have one but not are still learning to fly fish, or need a backup rod in case the fly rod does not pan out. They are also for fly fisherman - expert and novice alike, who have recognized a given situation calls for other methods... conditions limit fly fishing, casting is off but still want to fish, or the fly rod is not available - lost, broken,...oops, forgot to bring it (maybe). Bubble fly rigs can be used with heavy tackle or ultra-light gear because water (or vegetable oil) can be added to their hollow cavity to increase the weight as needed. 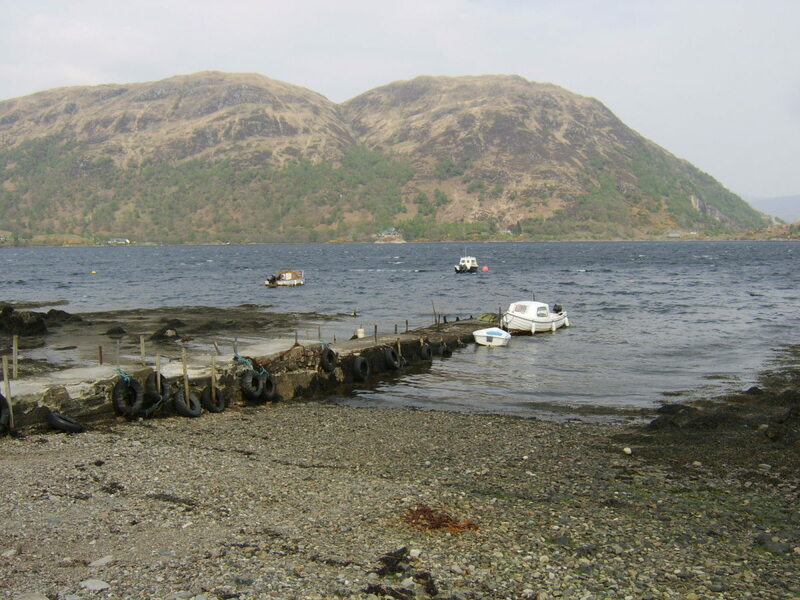 Subsequently, the fishing rod and reel you already own can be used; no need to purchase new rods and reels. 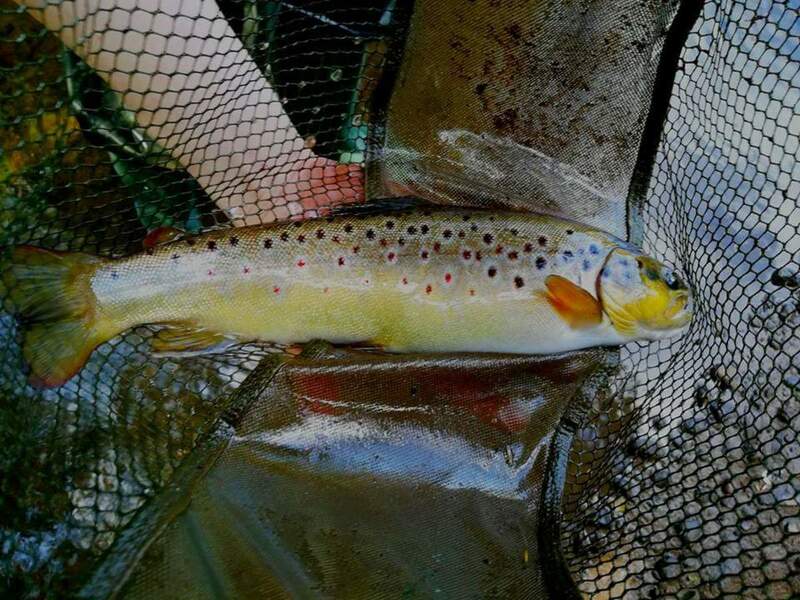 They can be used in the same rivers, ponds, and lakes to fish for trout and other fish targeted by fly fishermen using the same fishing flies. Bubble fly rigs work well fishing dry flies, wet flies, nymphs, and streamers. 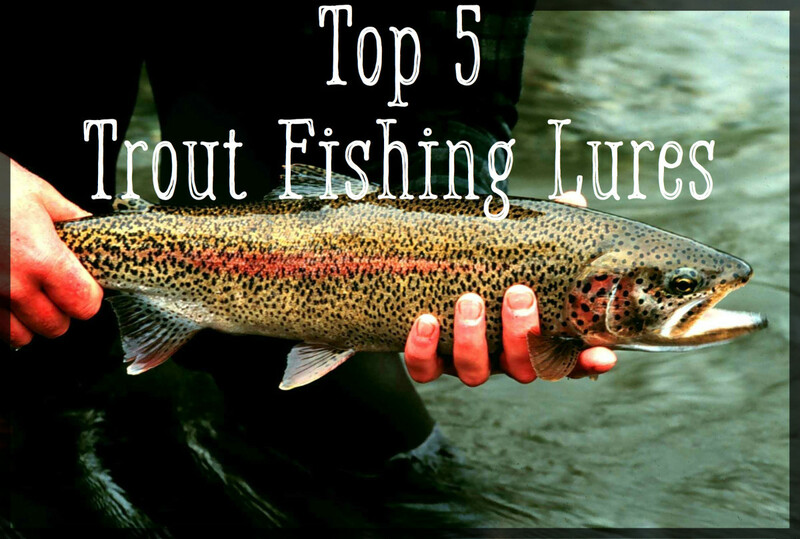 They also do double duty and work well fishing light lures like Power Worms and Trout Magnets, and Rat Tails as well as baits like Power Bait and Salmon Eggs. Readily stored in your tackle box or fly fishing vest; always available to use when needed! Can be fished on a dead drift with no motion, twitched with short pulls similar to fly fishing, with a steady retrieve, or with a stop and go retrieve. Whatever gets the fish biting! 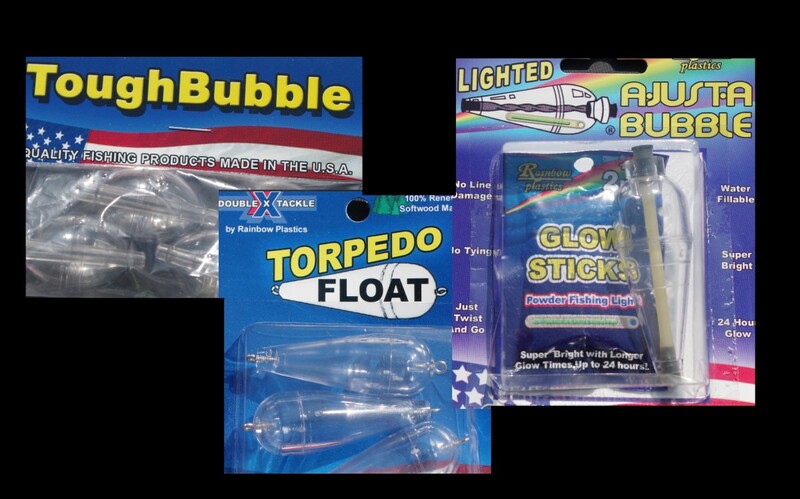 Do keep these considerations in mind and add bubble fly rigs to your fishing arsenal! 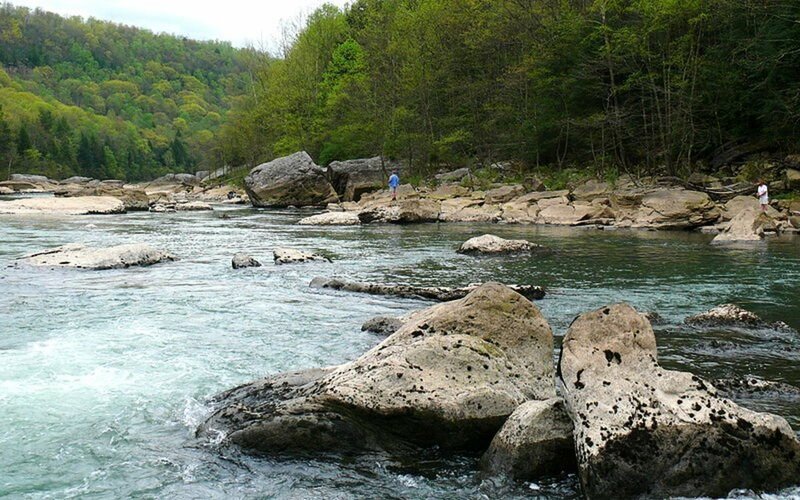 Did this article help you fish with fishing flies without using fly fishing gear? Some - Knew about Bubble Fly Rigs but learned something new.